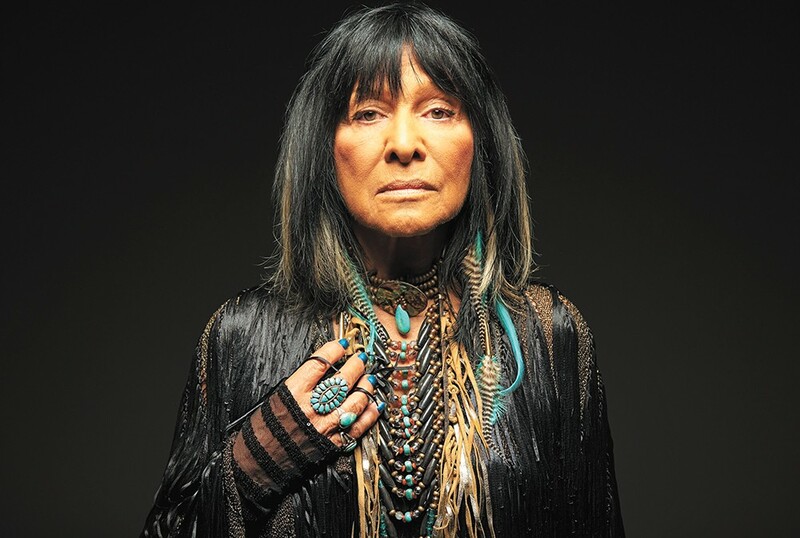 Buffy Sainte-Marie will perform at the One Heart Native Arts and Film Festival. When Canadian folk musician Buffy Sainte-Marie became a household name in the mid-'60s, everyone was still reeling from the assassination of President John F. Kennedy, and the Vietnam War was intensifying. More than 50 years later and Sainte-Marie is still producing impassioned, socially conscious music, but the state of the world hasn't gotten any less fractious. The legendary singer-songwriter will be in Spokane this weekend headlining the One Heart Native Arts and Film Festival, which is fitting, since she has always made her Cree heritage a focal point of her work. INLANDER: You started making political music in the '60s, and you're still doing it. Would you say the current political climate is more or less contentious than when you started out? BUFFY SAINTE-MARIE: About the same, although I have seen political consciousness and turmoil come and go over the years. I know a lot of people are discovering their sense of citizenship for the first time, and it's scaring them to death to witness the kind of things that make headlines. ... But we shouldn't be afraid of citizen action: We're supposed to express our opinions. And this is not our first go-round with bad leadership. I've seen crowds of people in the streets on many occasions and I take it seriously. I get troubled when people do nothing, seem not to see corruption in front of them. In what ways do you think music and art can impact or improve political discourse? Mostly with regard to public awareness. A three-minute song is shareable, replicable and can reach more people than a 400-page textbook in distributing ideas. But not all artists want to do that. Only some artists. And mostly there is no money in "causes," so it's hard to put together a business team because most everyone is raised to follow the money trail. But for those of us who really want to improve political discourse, songs can really stimulate thinking, discussing, and taking effective action. Your latest album Medicine Songs features new arrangements of some of your older work. How did you decide which songs to approach from a new place? A song is like a little snapshot or a little play, and every night it's a bit different. I wanted each song to sound like itself today. In some cases I just redid the song the same way: "Universal Soldier" — vocal and guitar same as 1963. Only recording techniques are better now and I sing better. In other cases. I wanted to rethink the words, particularly in the case of "My Country 'Tis of Thy People." When I wrote it in the 1960s, I was addressing U.S. audiences. My use of the word "genocide" shocked listeners. It was the first time most people had considered the idea of Native American genocide and they thought I must be mistaken. Now that Canada is so much more aware of residential schools because of Truth and Reconciliation [a Canadian commission dedicated to documenting the impact of forced relocation of Native schoolchildren], the song has an audience who can hopefully use the information. So I tailored the words to make the song more useful. In last year's documentary Rumble: The Indians Who Rocked the World, you talked about being blacklisted from American radio stations in the '60s. Do you think the music industry is still sidelining Native people, or even artists with outspoken political views? Of course, unless it's making money, as it did for awhile in the '60s. But you don't mention the impact of political administrations using their back-room influence to gag artists who threaten corporate power, as in energy companies who wish Indians would just go away. But whether it's politicians, corporations or just aggressive music business types, I've witnessed that there are always people who will help artists to fail or disappear with a big grin and just consider it "business." Native American people are a tiny minority population and unconnected to the ways European immigrant business families grow up in. ... But to our credit, our artists continue to make art and music and represent at whatever level they're currently at. As for me, whether I'm being ignored and "othered," or celebrated and applauded, it's all rehearsal for simply getting better at what we do best. You'll be in Spokane for the One Heart Festival, which celebrates Native American music, film and visual art. Who are some contemporary Native artists whose work you particularly admire? I've been recording with A Tribe Called Red, Tanya Tagaq, Derek Miller — love them all. But I also like Kelly Fraser a lot. DJ Shub. Don Amero. Crystal Shawanda. For anyone who has never seen you in concert, what is your live show typically like? Usually I have a four-piece band with me playing guitars and keys, but I'm playing solo this time. It's all my songs, all different styles. New ones, classic ones people ask for, whatever I feel like that night. If you arrive a little early while people are getting seated, we like to run a quiet slide show so you have something to look at. You've recorded hundreds of songs over the years, but if you had to pick a single song that summed up your entire career and artistic philosophy, what would it be? The original print version of this article was headlined "Carry It On"